Join us on Tuesday, April 24, 2018 from 3-6pm to celebrate our first anniversary at our facility located at 1535 Cogswell St. unit C-15 - Rockledge. 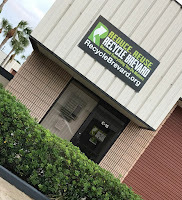 Bring reusable items, TerraCycle hard-to-recycle items, and unwanted electronics to recycle at our facility. We plan on having music, light refreshments, and plenty of information to share. The City of Rockledge will be doing a ribbon cutting ceremony at 5pm. No RSVP necessary, but mark your calendar and come to visit us. We would be honored to share this day with you!